Today is the day after World Kindness Day, but we can’t limit ourselves to one day of kindness. A small kindness can have a big impact; it can brighten a lackluster day and turbo-charge an ordinary day. 1. Be kind in online comments. Every news story has supporters and detractors, and online news sites let reader post comments anonymously. It’s easy to forget that there are real people behind those usernames. It’s even easier to type negative remarks or bullying comments that you probably wouldn’t say face-to-face. You can be respectful even when you disagree with someone. 2. Be kind on social media. Sometimes social media helps you create an idealized image of your life. Sometimes social media lets you vent your anger, fears, and frustration. When you see glimpses of other people’s amazing, awesome lives, don’t compare them with your own life. And when you read about or share depressing or horrifying news, balance it with a little kindness in your social media feed. 3. Be kind to our past self. We sometimes think the worst of our younger selves, dwelling on past mistakes and failures, instead of focusing on our past accomplishments. I’m guilty of this – I often find myself unintentionally replaying embarrassing moments and disappointments, even though I don’t want to remember them. I can’t seem to stop myself. But if you can forgive a past mistake or mischief in someone else, then you can forgive your younger self. 4. And be kind to your future self. We sometimes have unrealistically high expectations of our future selves, setting ambitious goals and over-committing our time and energy, instead of setting realistic goals and respecting our time in the future. Treat your future self will as much care as yourself today, being careful of your future self’s time and money, suggests productivity blogger and author Chris Bailey in his book “The Productivity Project: Accomplishing More by Managing Your Time” (2017). 5. Appreciate other people’s acts of kindness. There is kindness all around us, but often these small, everyday courtesies go unnoticed. As you do small acts of kindness, be aware of the small acts of kindness that you see – and that happen to you. 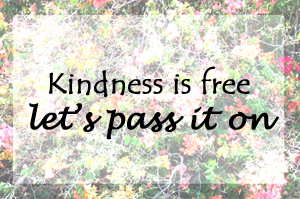 Do you perform random acts of kindness? What is the kindest thing someone has done for you recently? This entry was posted on November 14, 2017 at 5:00 am and is filed under Community, Family. You can subscribe via RSS 2.0 feed to this post's comments.